Ah, the kids from the BCC. The ones I met for the first time in December of 2005, and the ones I’ve thought about every day since. I love these children and finally, after almost 2 years, I was able to return and see them once again. If you just want to see photos, jump to the "Photos" page for a sampling, using the link at the top of the page, or go to my SmugMug site for the entire complement of BCC Kids photos. 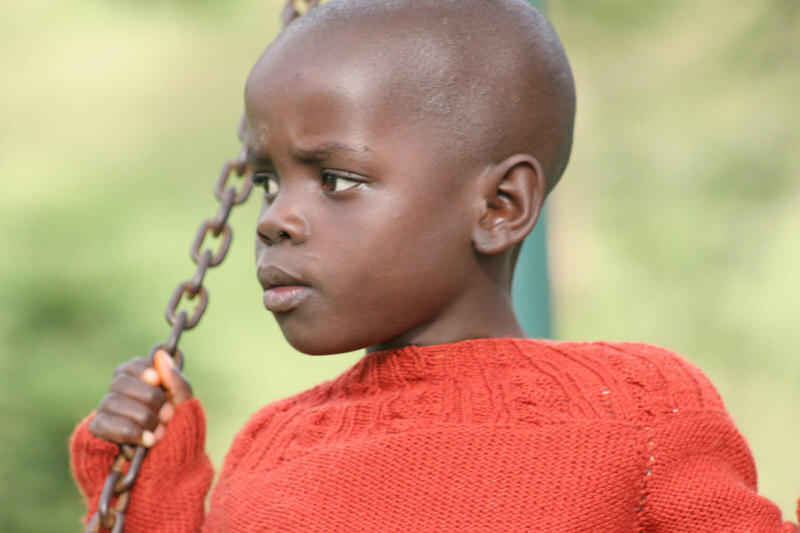 One of the primary goals of Buckner and the BCC is to place the kids in foster care. 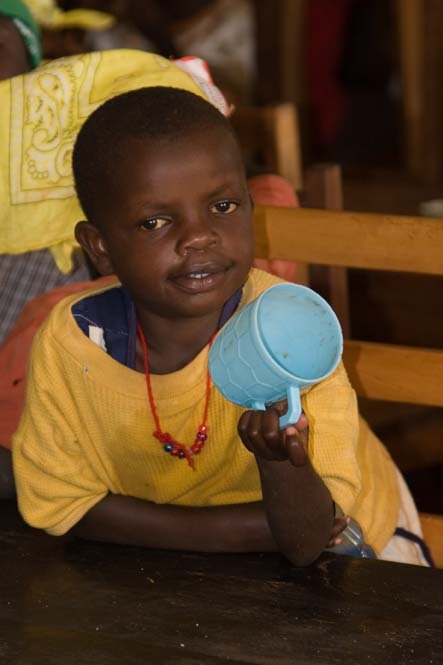 This allows them to learn all the things kids learn when part of a family: how to fetch water, clean house, obey parents, clean up after themselves, etc. 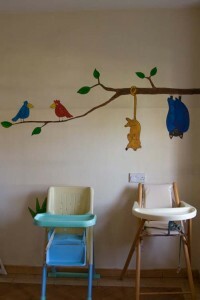 The BCC is great, but it is much more desirable for these kids to be placed with a family. Some of the kids we visited are in foster care, scattered about the country, but they return to the BCC over the Christmas break so they can come to Brackenhurst and have Christmas. Most of the children, though, live at the BCC in one of the dormitories. 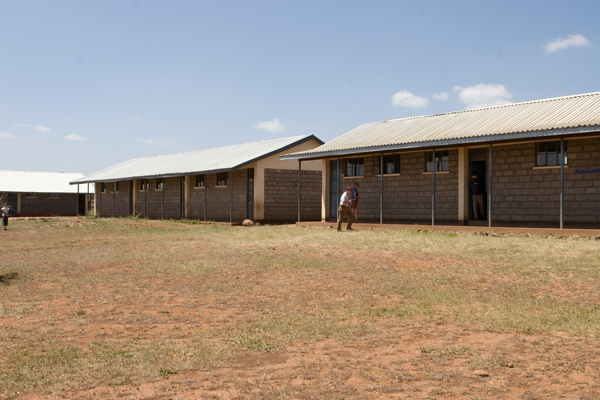 As for school, the BCC is in the process of building a school complex, and is currently set up to school younger kids. 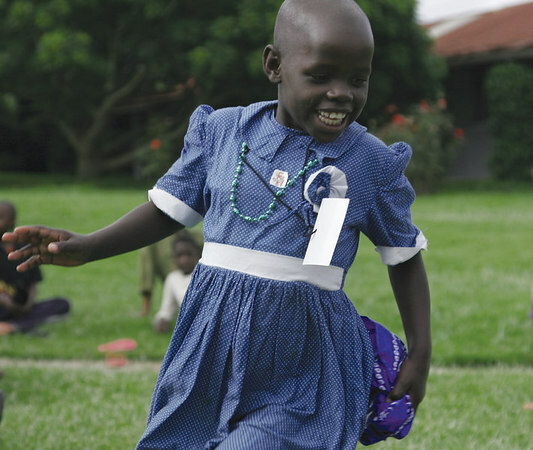 The older kids must travel by foot to school, sometimes walking back and forth quite a distance. The grand plan, as I understand it, is to construct enough school buildings to accommodate all of the BCC children, up to 8th grade. This will be a major accomplishment and will benefit the kids enormously. 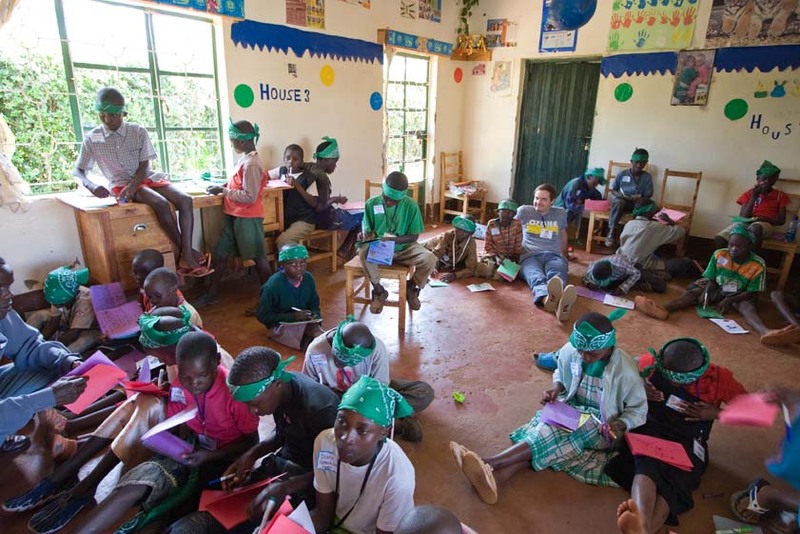 After 8th grade, the hope is they can move on to High School, typically a boarding school. I will write more about the BCC in my next post, so I'll move on. As at Seed of Hope, we did VBS, games, activities and visiting. 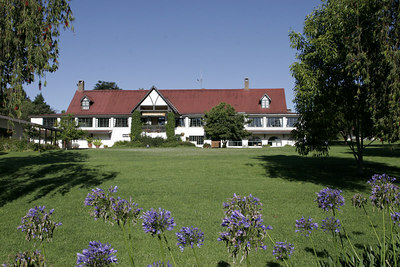 Unlike Seed of Hope, however, we stayed at Brackenhurst alongside the kids. This afforded us much more time to be with them, more free time to just hang out and visit. We ate all our meals with the kids as well, which was a blast. All in all, it was less rushed with the BCC kids, more relaxed. As a result, and despite a bit of a slow start, we ended up probably digging deeper into the lives of these kids that those at Seed of Hope. One of the joys of traveling to Kenya repeatedly has been the chance to see the same kids, and to be able to see them grow and mature. This was really brought home on this trip as I hadn't seen them in almost two years. (There were no trips to Kenya last Christmas as the country was shaken by violence surrounding a presidential election.) I was a bit curious if the kids would remember me, and if I would remember their names, but it really was as if I had just left. Many of them called out to me by name as we arrived, and their names came to me, in most cases, pretty easy. As I said above, I've been thinking about these kids every day since December 2005. And they've grown! The little ones aren't quite as little, and the older ones are now well on their way to becoming young men and women. It was so very encouraging to see how the kids had progressed, how their English had improved, how their frames had filled out, how their confidence had grown. It was very, very satisfying to sit down, after 20 long months, and catch up, listening to their stories of school and life and everything. As I sat listening, and, later, as I ran around playing, I was solidly struck by the overwhelming feeling these were MY kids. Not my biological kids, of course, but the kids, above all others, I know and love. I hope to come to know the Seed of Hope kids just as well, but for now, the BCC kids have my heart. It was heaven on earth for me to just see them again, to hang out and play, to goof around, to hug and tell good night. I hadn't realized how much I had missed them. Thank you Lord! As always, time flew. We did VBS, played games, went to the tea fields, watched the Polar Express (the kids would laugh at the oddest things...very different than watching the movie with American kids), and prepared Christmas gifts. The morning of our last day, I donned the Santa suit again, made my appearance (these kids weren't quite as frightened...more amused, I'd say) and watched in joy as we delivered the gifts so many (of you ) donated. Oh, the kids loved it! The toys, the clothes, the stickers, the candy, the dolls, the books...everything! They were so very, very excited and happy. I couldn't help but tear up watching the kids, old and young, dig into their gifts with such excitement, such appreciation, such wonder. I particularly watched some of the younger kids, a few whom I knew had never before had Christmas. Man, what a party. What an absolute joy to be there. Unfortunately, we had to shortly thereafter hit the road. Tough, tough, tough. As always. We said our goodbyes, got in the vans...and waited. And waited. So a few of us got out and said goodbye again, threw around a few more hugs, gave our addresses out a few more times...then got back in the vans, this time to leave. I'll be back. I hope to always go back, God willing, to go see "my" kids. It's a sacrifice - it's expensive, and a long trip, and tough on the body - but it is always, always worth the effort. Perhaps there will come a day when I don't go back, when I have taken my last trip to see the BCC kids. I can't imagine such a thing, but I suppose all things end at some point. 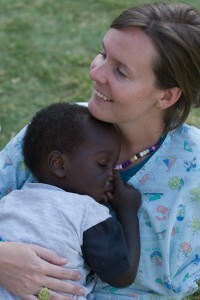 For now, however, God has given me a heart and passion for these children, and the countdown to December 2009 has begun. I'm back, of course. I was unable to post while on the Safari, then spent a couple of days traveling back home, a day wandering around the office with jet lag, a day sick in bed...it's all good now, though. Let's write! I think I'll approach the trip logically: since there were four distinct "stages" of the trip (excluding travel...who wants to read about that? ), I'll follow suit with my recaps, chronologically. I'll write about each of our stops and, when warranted, include some photos. If you just want to see photos, jump to the "Photos" page for a sampling, using the link at the top of the page, or go to my SmugMug site for the entire complement of Seed of Hope photos. 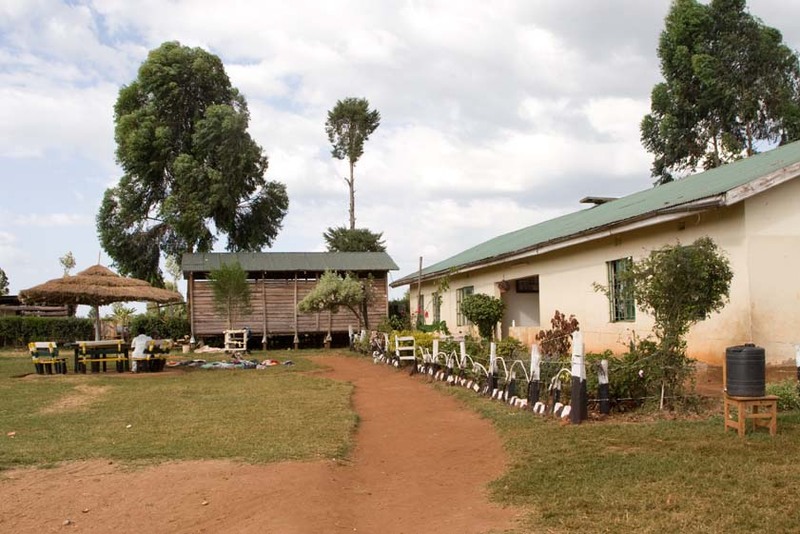 Kitale is a medium sized town in the western part of the country, not far from the Ugandan border (in sight of Mt. Elgon). We flew from Nairobi to Eldoret (45 minutes), then drove the rest of the way (1 hour). 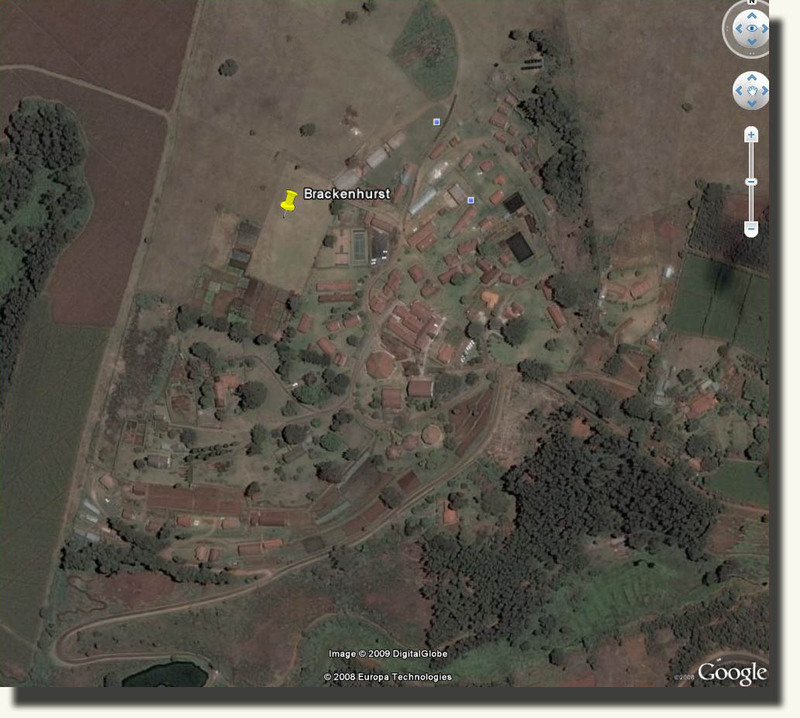 Here is a link to a decent map that clearly shows Nairobi, Eldoret and Kitale. Although Kitale appeared pretty peaceful while we were there, the town did experience considerable violence after last year's presidential elections. In addition, there was a violent attack on an elderly missionary couple last summer. There are many, many orphans in this part of the country. It is a rural area, tradition bound, and AIDS is rampant. You can google thousands of articles about the causes and effects of AIDS in Africa...here is a link to just one short article (the town mentioned in the article, Busia, is not too far from Kitale). 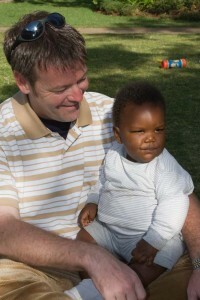 Buckner just recently joined with the Seed of Hope orphanage; the kids have had only a few groups come visit. Here is a blurb on the Buckner website. The orphanage sits on the edge of town, as best I could tell, and the roads leading to the compound were quite...interesting. The orphanage houses around 80 or so orphans on site (rough guess), and has another 35 or so in foster care. This was my first time to visit any other group of orphans besides the BCC kids. My initial impression upon arriving was one of pleasant surprise. To reach the orphanage, we were forced to take a bit of a detour over a decidedly tortuous road (the usual route was blocked by an overturned truck). Along the way we passed through several sections of huts/houses, constantly accompanied by small children running after our vans shouting "howareyou! ", "howareyou! ", the standard child greeting shouted at Muzungu (white people) tourists all over Kenya, if not the entire continent of Africa. 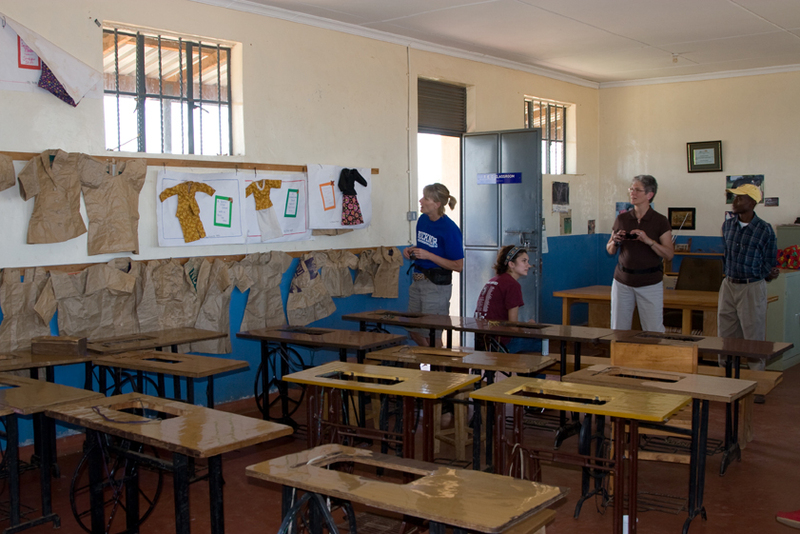 Once we arrived at the actual orphanage, I was struck by how orderly and peaceful it was. 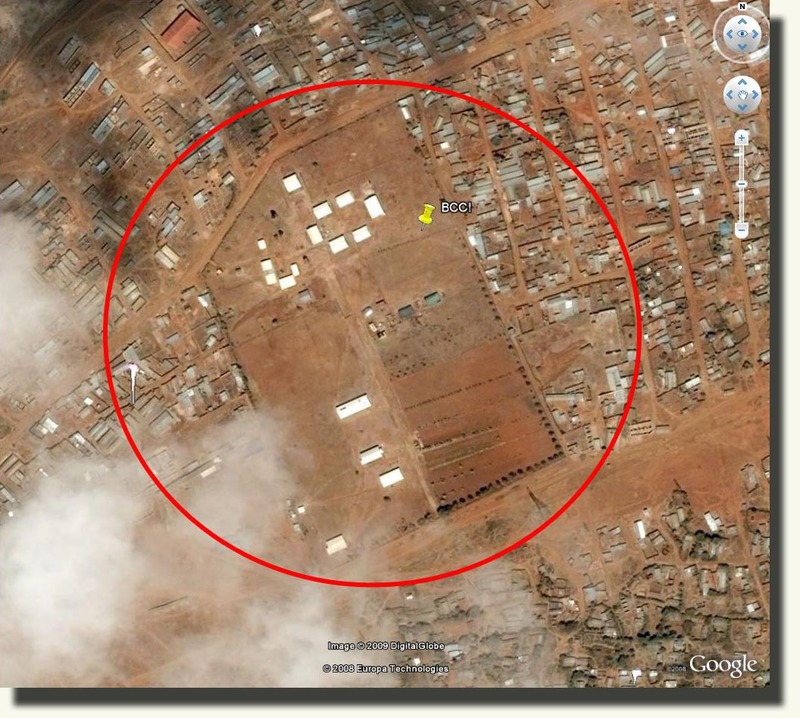 Although not nearly as spacious, in terms of available land, as the BCC in Nairobi, it all appeared neat as a pin. The grounds were somewhat landscaped, and there was real grass growing where the kids could play. There was a slide, a shade tree, a small clearing for the kids to play soccer, and quite a few buildings scattered about. All in all, the facility really reflected the pride the staff obviously felt. Below is a photo of a small corner of the SOH. The kids were great. I won't belabor the point, as I wrote somewhat about the kids in a previous post, but...they were great. Almost all of them were so eager to visit, to hold your hand, to just sit and goof around. 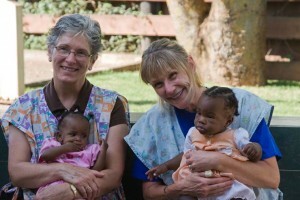 They loved to laugh and talk Swahili, knowing we had no clue what they were saying. They liked to feel the hair on our arms, sing for us, teach us how to say things in Swahili (Habari Gani? = "what's the news? ", kind of a "how are you? "), anything, really. It was obvious early on these kids enjoyed our company, and thought it quite the treat we had come to visit. 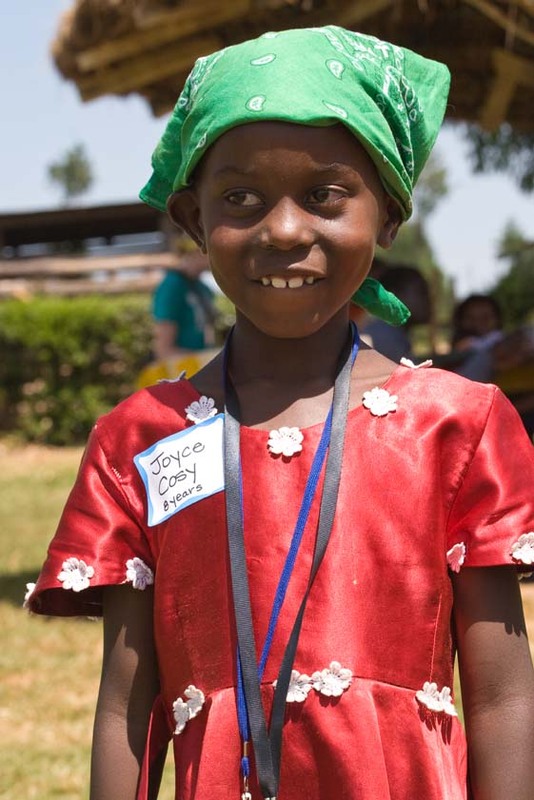 During our VBS activities, the kids would sit very quiet, paying close attention to everything going on. When we did crafts, they would pour themselves into the activity, whether it was making caterpillars or Christmas bags or Christmas cards. They really liked to create and use markers and draw and write Bible verses (of which they knew many)! It was so enjoyable to watch them at work. 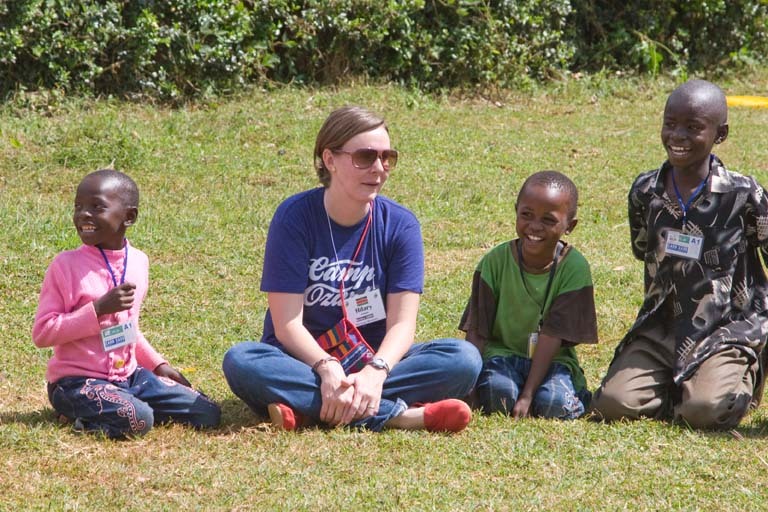 Throughout the first and second day, we played games ("Red Rover, Red Rover, send the fat Muzungu over"...that would be me), did VBS activities, ate lunch and visited. It was a very, very good time. I got to know some of the kids better than others, and, as always, was so touched by their spirit of kindness and gentleness. These kids have a "soft" way about them. They don't scream and yell too much, and rarely seem to get angry or have conflict...some, but not very often. They like to sit and talk, maybe sing. 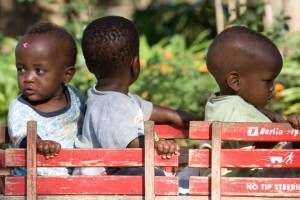 They're pretty content, oftentimes, to just watch others play, and laugh. Truly, the way they play together, hang out, visit amongst themselves, it's all something to see. They aren't perfect, and I saw some things on occasion that clearly indicated these kids are missing a parent's influence in their lives, but overall, they really are amazing children to be around. On our last day, Sunday, we went to church with the kids in the morning. It's almost impossible to explain what it's like to attend a Kenyan church, but suffice to say there is lots of music, lots of children dancing and singing, lots of movement...very Kenyan! The sermon was very good, but just being in the church, worshiping and singing with the kids, that was what it was all about for me. After church, we walked back to the SOH to distribute Christmas gifts before we left. Our group leader, Jessica (bless her heart), brought a Santa suit for someone (guess who) to wear. So, properly suited up, with white beard and rosy cheeks and everything else, I made my grand entrance to the excited sounds of...gasps of fear? Seems the kids had never really seen Santa, or Father Christmas as they call him, in real life before and it was, perhaps, maybe a bit much for some of them. Luckily we calmed everyone down and proceeded to hand out gift bags full of goodies: toys, stickers, candy, sunglasses ("goggles"), and the like. 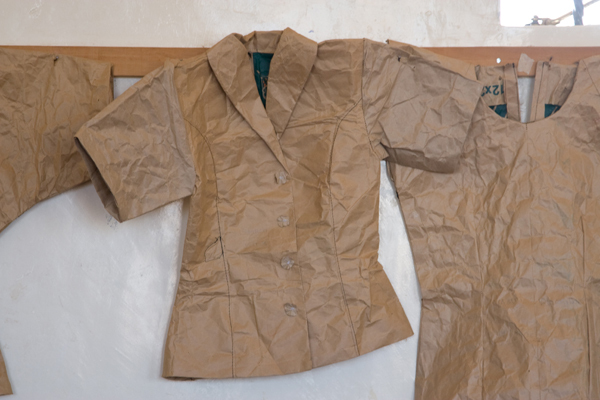 The kids also received clothes, paid for by donations made to the SOH (by some of you, perhaps!). All in all, it was a wonderful time observing the kids with their gifts. 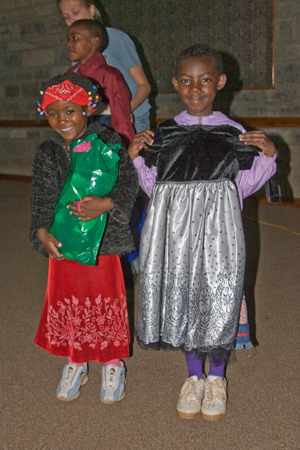 For some, it was the first time they had ever received any sort of gift at Christmas...what a blessing to be a part! As it was for most of our time at the SOH, the kids were fun and laughing and happy and really having a good time. Sometimes, though, during all of this fun, it was necessary to pause and remind myself with whom it was I was spending time. It was tempting to allow the laughter and joy and fun to somehow ameliorate the sorrow and misery and pain most of these kids have experienced. It wouldn't have been right, or fair, to forget they are there, at the SOH, because one or both (probably both) of their parents have died of AIDS. To forget they are there because they have little or no family. That they are there because they have no other place to be. There were plenty of reminders; several of the kids bore pretty frightening scars, from what cause I never found out. Some had AIDS themselves. If I spent the time and looked hard, past the fun and games, the real tragedy of what's happened, and is continuing to happen, in Kenya, in Africa, would come sharply into focus. It's a tough thing to ponder. I don't know what will become of these kids. I think this thought, more than any other, is what affects me the most, what discomfits me so intensely. Where will they go when they get too old to stay at the orphanage? What will happen to them if they aren't able to complete their education? What will happen to them even if they DO finish High School? How will they make money? How will they buy food? A house? Live? There are a hundred roads these Kenyan orphans can travel, I suppose, and I get the feeling almost all of them are dead ends. Is it hoping against hope for them to find joy and meaning and purpose in their lives? I honestly don't know...I don't have a real grasp yet on what the opportunities will be for them down the road. It's a terrible mystery to me, and it angers, saddens and frustrates me. That being said, however, I can't ignore the good things. Undeniably, through the blessings of God, these kids have found themselves in a loving environment, surrounded by talented, caring, Godly caregivers and social workers. They are fed, clothed and cared for physical and emotionally. They attend school. They learn the Bible, and of God's love. They sing and play. Additionally, Buckner seems to do a very good job in terms of organizing support systems for the kids, establishing educational opportunities, obtaining necessary funding, coordinating staffing and supervision...all the myriad of things which must occur for the kids to live and eat and grow and learn. Undoubtedly more can be done, and living in a center is certainly not ideal, but to think about where these kids could be versus where they are now...well, they are in about as good of hands as possible, given the circumstance. In the end, I guess, I just move along in faith that God's plans will be realized, and that He has plans for each and every one of the kids.